All finished. My first mittens, named A Thousand Acres. They are cute and kid-like though fitting a small/medium woman's hand. Do you think their name is a little too grand? Oh well. 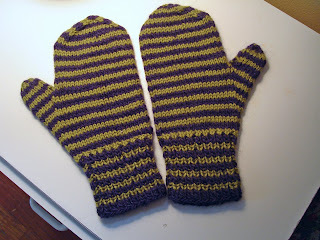 The second mitten came out better than the first. These are borderline as to whether they are good enough to give. I made a mistake in the thumb gusset. Seeing that I got 6 rows to the inch rather than 7, I added a few rounds to the gusset part where the work goes in rounds rather than inches. I have made that type of mistake before, trying to be too precise. The thumb gusset is thus too deep. I'll have to see how subsequent attempts come out before I decide to keep these or give them away. 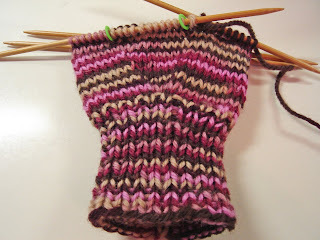 This is the basic mitten pattern from Ann Budd's pattern book. The yarn is leftover Paton's Classic Merino in Rosewood. I made my mother's Christmas Clapotis from it. They are knit on #5 US Crystal Palace bamboo double pointed at 5 stitches and 7 rows to the inch. But I'm not messing with the row gauge. I just started listening to Marilynne Robinson's Gilead so, assuming that I stick with the book, I will have to name these Gilead Mittens. What is with Kansas abolitionisim before the Civil War? This is the third book I have read recently with this theme. The Civil War era has such a strong hold on the American imagination. No I don't think it's too grand a name. It's rather cute. I think of farrowed fields when looking at them because of the name.